The Epson Perfection V750 Pro is the "big brother" of Epson's Perfection V700 Photo. The device is being delivered with the professional scanning software SilverFast AI6 and the color management tool MonacoEZcolor. Included is also Epson's own scanning software EpsonScan. For the "big brother" also counts that flatbed scanners are only somewhat good for scanning film material, because the picture quality doesn't come even close to the quality of a "real" film scanner. The results from affordable flatbed scanners, which are for marketing reasons equipped with a cheap transparency unit, are mostly miserable. In our online shop there are film holders and accessories for the Epson V750 Pro still available. We tested the Epson Perfection V750 Pro in the summer of 2007 and wrote the following short test report. The Epson Perfection V750 Pro differs almost solely by the software equipment from its "little brother". Therefore we want to talk here particularly about the differences resulting from it. We already published a detailed test report about the Epson Perfection V700 Photo on a separate web page. You can read everything about equipment, accessories and performance data of the scanner, its installation and start-up as well as scanning of different picture/film formats in the test report on the Epson Perfection V700 Photo. Herein the scanners do not differ. In the following we only talk about some points which are specific for the Epson V750 and differentiate him from the smaller V700. Since July 2013 Epson delivers the Perfection V750 Pro not any more with SilverFast Ai Studio version 6 and Monaco targets but with the new SilverFast SE Plus version 8. The Epson Perfection V750 Pro has been replaced by its successor Epson Perfection V850 Pro in November 2014. The Epson Perfection V750 Pro will be delivered with an extensive software package. It contains the manufacturer's own EpsonScan, Adobe® Photoshop® Elements 3.0, LaserSoft Imaging SilverFast AI 6 as well as the color management MonacoEZcolor, which unfortunately wasn't included with our test device. The handling of EpsonScan is described in the test report about the Epson Perfection V700 Photo. Adobe®'s Photoshop® Elements is a good program for the simple processing of pictures like cropping, color corrections and retouching. This is an amateur version with limited functions of the professional picture processing software Adobe® Photoshop® and became established as standard. LaserSoft Imaging's SilverFast is a professional scanning software, which is available for nearly all scanner models. It can improve the image quality substantially. You can read more about the difference of scans made with SilverFast and EpsonScan in the next chapter. Everything that was said about this topic in the test report of the Epson Perfection V700 Photo applies also to the here tested V750 Pro. So we want to talk here only about a few specific points. Since the test of the V700 refers only to scans made with EpsonScan, the topic is mainly about the differences resulting when using SilverFast. The technical specs promise much, but the V750 is not able to hold those promises completely. That shows in the resolution test: despite its "High Pass Optics" - an optical system improved in comparison to the V700 - the V750 does by far not reach the claimed 6400 dpi. To be precise: the resolution test resulted in identical values to the "little brother". The Scan of the USAF Testcharts showed the horizontal lines of the element 5.3 and the vertical lines of the element 5.5 being just about possible to differentiate. According to this we get a resolution of only about 2300 dpi - that's just 40% of the claimed resolution! The sensor of the V750 is able to get the indicated 6400 pixels per inch, however the "High Pass Optics" system of the scanner does not nearly reach the required quality required for capturing with the full resolution. Regarding this, the Epson V750 is also losing against the high-quality film scanners. 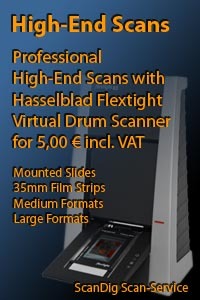 There are however many favorable film scanners, which do not offer more or offer even less effective resolution. Regarding the density range of the Epson Perfection V750 Pro, which is indicated as 4.0, one must say that here it doesn't reach the high-quality film scanners either. Where those still show detail in very dark picture portions, with the V750 everything is black, and very bright portions of the picture are blooming out quicker. More information and explanations to the density range can be found on our special page about density and density-ranges of scanners. Here however SilverFast can help. The software of course can't increase the density range of the device, but it brings a substantially more homogeneous texture into the dark portions of the picture. I.e. where EpsonScan only presents unclear picture information, SilverFast still produces amazingly much detail. In general, scans made with SilverFast using the standard adjustments look already more naturally coloured and better balanced in the tonal distribution. After little training, one can use the adjustment possibilities from SilverFast in order to get the optimum from the scanner-target-combination regarding colour, contrast and sharpness. EpsonScan (as well as almost all other manufacturer-own software packs) is losing here evidently. SilverFast clearly upvalues the scanner - that's the big difference in comparison to the V700. Unfortunately SilverFast wasn't used as a possibility to calibrate the scanner (the provided version does not support this function), but a tool named MonacoEZcolor and a suitable calibration target, instead. This software was however not provided with our test device, so that unfortunately we cannot report on the functionality and results. Too bad, because naturally we're very interested in how well an IT-8 calibration with an unknown tool would work in conjunction with the SilverFast software. I can only assume that the original SilverFast IT-8 calibration is better and has a more precise target, but also is the more expensive solution. It's a pity that for the Epson V750 Pro the IT-8 calibration of SilverFast is not even available for a surcharge. Regarding transparent material the hardware-based dust and scratch removal Digital ICE achieves good results with the Epson Perfection V750 Pro and "cleans" the negative or the slide without causing general blurring to the picture. Regarding reflected light material, the effect of ICE depends on the surface of the picture, at best hardly visible (with completely smooth surfaces) and at worst the scan becomes completely useless, because the original can't be recognized anymore (happens with structured surfaces, e.g. semi matte). With reflected light material other devices yield clearly to better results, for example the unfortunately no longer available Canon CanoScan 9950F. One can say that the picture quality of the Epson Perfection V750 Pro can be clearly improved by using SilverFast. The device is more suitable for demanding purposes than the V700, but due to the relatively low resolution and the low density range, won't satisfy professionals, whom the Epson Perfection V750 Pro already adresses with of its type designation ("Pro") and the possibility to scan medium format and large formats. Everyone, who digitizes own slides or negatives with this device, should consider the resolution problem well. One can get 7 megapixels out of a 35mm-picture slide or a negative, which is today already exceeded by many digital cameras, although the slide or negative actually holds about 10-20 megapixels of information. This means through scanning one gives away valuable picture information. While 7 Megapixels still sound decent nowadays, it is foreseeable that in 10-15 years only digital cameras for starters will produce so few pixels. Then the old scans will stay clearly behind the current quality and one will have to redo the scans eventually. So the Epson V750 Pro reaches in practice just about 40% of the nominal resolution. The effect shows in the way, that one scans with the highest resolution of 6400 dpi and gets pictures of about 60 Megapixels, thus files of approximately 180 megabyte (uncompressed). Then one shrinks the picture through the picture processing program and receives effective 7 megapixels and files of approximately 20 megabyte (uncompressed). The scanning times of the Epson Perfection V750 Pro don't differ from those of the Epson V700 Photo. We measured exactly identical times. As mentioned earlier, when scanning film material one cannot expect the same good results from a flatbed scanner as from a high-quality film scanner. The Epson Perfection V750 Pro is designed, just like his competitiors, to scan mainly reflected light material. The use of SilverFast however also makes the scanning of film material with acceptable results possible. These still don't reach the results of a good, genuine film scanner, but can satisfy users with not too high requirements. The V750 Pro in connection with SilverFast is quite able to make a scan of a film, which can then be exposed in useful quality, e.g. on photopaper format DIN-A5. It is great, that one can use nearly the whole surface for the scanning of transparent media and can this way scan almost everything which is transparent and flat, up to a size of 8x10". The integration of the hardware-based dust- and scratch correction ICE is also praiseworthy. For professionals with corresponding, high expectations to a scan, and for people, who want to scan a lot of pictures, this device is not the right one. The image quality is not good enough to compete against a good film scanner (even though it can be increased with SilverFast when compared to the V700 Photo), the scanning speed is extremely slow, and the effective resolution of 2400 dpi results in 7 megapixels for 35mm material, even though the files are extremely bloated with about 60 megapixels. The Epson V750 Pro provides good services for the regular paper scanning and is well suited to digitize one or another slide; e.g. for a web page. For permanent archiving of slides and negatives in digital form, I still regard the V750 Pro as unqualified. Please, feel free to visit our online shop - it's the only shop on the Internet which is fully specialized on film scanners and accessories! We can provide you with any film scanner at an extremely attractive price and we also can supply you with accessories such as film holders or optional adapters.